Sundance 2011: Movies we’ll see soon! Do you find yourself looking up a new, exciting film only to find that people have been blogging about it for months? “Oh, it was a huge deal at Sundance this year, didn’t you know?” Well, we’re here to help. These are the top three Sundance films you need to read about before they hit theaters. The Sundance Film Festival always has some eclectic offerings. But which ones will you see in the theater this year? We’ve got our three picks for films to watch for coming to your local cinema in 2011. Sundance 2011 highlights include the directorial debut from a wonderful actress, a long-promised political horror flick from an often controversial director and a comedy from an actor who never disappoints but often works with a disappointing script. Higher Ground: First, a description of the film, “A frustrated young mother turns to a fundamentalist community for answers, but after years of dogma and loss, she must find the courage to ask the questions that will help her reclaim her life.” Vera Farmiga has always been an actress to watch. She’s done under the radar roles forever and nailing them. A particular favorite was Rod Lurie’s Nothing But the Truth. Haven’t seen it? Do yourself a favor and rent it right this very moment. Higher Ground is Vera’s directorial debut and we’d be stunned if she didn’t nail it. You really want the whole story? Follow Kevin on Twitter at @ThatKevinSmith. He’s still one of my favorite interviews ever. No matter what you think of the film, you’ll likely be rivited. 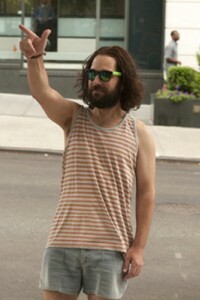 My Idiot Brother: The fim’s summary says it all, “Despite looking for the good in every situation and the best in every person, Ned always seems to find himself holding the short end of the stick — being conned into selling pot to a uniformed cop, being dumped by his girlfriend, and worse yet, losing custody of his beloved dog, Willie Nelson.” Poor Paul Rudd. He usually does a fantastic job with some pretty crappy material. He’s pretty darn funny and a serious talent. Here’s hoping this film shows him off as the talented actor his is. The film also boasts Elizabeth Banks, Zooey Deschanel, Emily Mortimer. I’ll see you in line at the theater.